37 mm stainless steel case, stainless steel crown with a pink sapphire cabochon, sapphire crystal, white mother of pearl dial with diamond indexes, automatic movement, stainless steel bracelet, folding buckle. 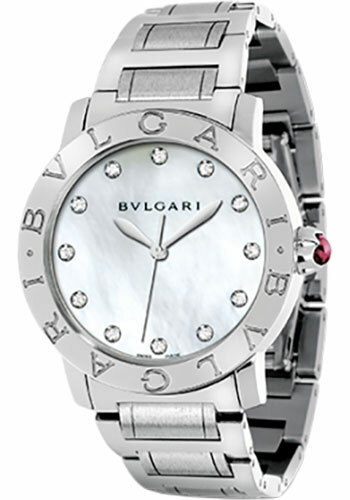 Water resistant to 100 ft.
37 mm stainless steel case, stainless steel crown with a pink sapphire cabochon, sapphire crystal, white mother of pearl dial with rhodium plated indexes and date indication, automatic movement, stainless steel bracelet, folding buckle. Water resistant to 100 ft.